My name is Kaylin Lane and I am currently a college student majoring in Public Relations. Growing up, I was involved in dance, competitive cheerleading, and tumbling. When I started my freshmen year of college and was no longer in these activities, I wanted a pick up a new hobby to stay in shape. I tried out one kickboxing class at CORE and have been hooked over since. 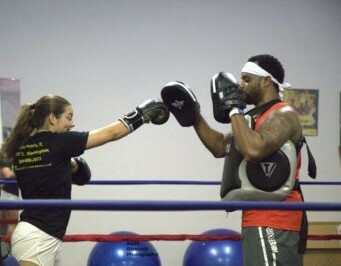 Now a year later, I have been given the opportunity to continue my passion for kickboxing as a personal trainer. I am so excited to see where this opportunity takes me, and to further my knowledge about boxing and other health and nutrition tips. CORE has become not only my kickboxing gym, but a second home for me with my fellow trainers and members. I could not imagine my life without kickboxing!